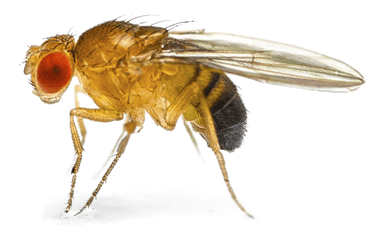 As if Drosophila have not contributed enough to the field of genetics, they are once again being used as a model organism for genetic research. In a recent study, these flies are being analyzed for transcriptome changes that are associated with increased longevity and lower odds of premature aging. As organisms age, their organs begin to malfunction and they are susceptible to conditions such as Sarcopenia, which a condition where skeletal muscle begins to lose its mass and function. This is commonly seen in humans, other mammals, and even flies. The research with Drosophila has revealed that this deteriorating muscle undergoes many changes in gene expression during the aging process. To test their hypothesis, researchers over-expressed a gene in Drosophila that coded for a resistance against glutathione, an antioxidant that causes the muscular deterioration associated with aging. The researchers found that this indeed led to an increased lifespan. The fact that Drosophila are still being used as model organisms over 100 years after heir first use really amazes me. This research is amazingly useful as well. In the short term, being able to expand the lifespan of fruit flies and other experimental organisms would allow for maximum data collection in terms of scientific experiments. However, the findings of this experiment may also open the door for the next billion dollar industry if this anti-aging process is made possible in humans. The promise of being younger for longer is something that many people would pay absurd amounts to achieve, and whoever is the first to make this possible will have quite the retirement fund. It is incredible that Drosophila are still being utilized for new research all these years later. Sarcopenia is a condition that does affect many individuals as they age, so some type of remedy would be welcomed. Antioxidants and aging seem to be very popular topics right now, so identifying a gene in Drosophila that can be over-expressed to resist glutathione is exciting news. It will be interesting to see what researchers do with this information.